The subscription economy is here, and Patreon is leading the charge. Founded in 2013 by YouTuber and one-half of Pomplamoose Jack Conte, Patreon is currently doing $7.5 million in revenue, with a valuation of $450 million. The artist subscription content service provider not only helps content creators sell their products but also helps them build relationships with fans, and it invites patrons to buy into each creator's artistic process. In this episode of pricing page teardown, ProfitWell CEO Patrick Campbell and General Manager Peter Zotto break down willingness to pay for content and how that can affect Patreon's pricing strategy. Being a patron of one of Patreon's 50,000+ creators means more than just providing the financial backing for a project: People are buying into someone they have a relationship with. They want to be a part of a movement and be involved in every step of the process. For the content creator, that means that the relationship with their patrons is paramount. We surveyed 8,438 current, former, and prospective customers of Patreon and Kickstarter and found that the longer a relationship exists between a patron and creator, the more the potential willingness to pay increases. 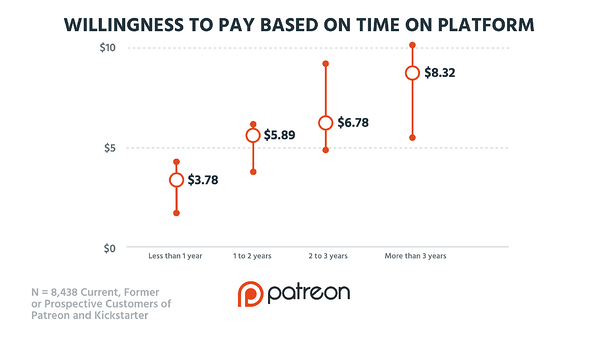 When a patron has known the creator for less than one year, their willingness to pay starts relatively low, at an average of $3.78. That increases dramatically in the one- to two-year band, at $5.89, an almost 50% boost. In the two- to three-year band, it increases again to $6.78. What's even more surprising is that the willingness to pay jumps again after hitting the three-year mark, skyrocketing to $8.32 and flexing up to over $10. Overall willingness to pay is going to vary drastically as well, based on what kind of content is being produced. Creators need to research the general trends in their category band to make sure they're setting reward tiers that are in line with what their audience expects to spend for their art, music, podcast, etc. The median willingness to pay for a musical artist or band is around $5, flexing up to a little bit more than $10, while podcasters see a median willingness to pay starting at $9 and flexing up to more than $15. 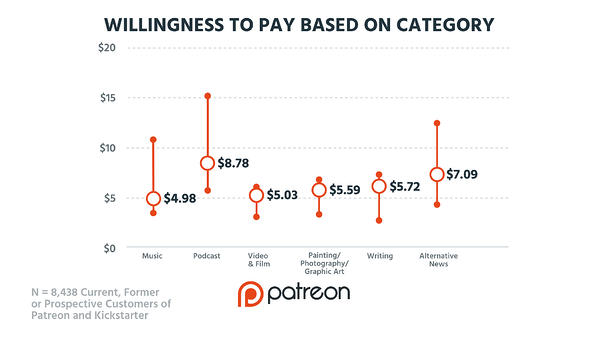 Across the board, we're seeing an average willingness to pay that starts out around $5 a month, which is higher than what most creators are setting for their first pricing tier. Most creators are setting their lower tiers to start around $1 to $4 and go up from there with additional rewards. Instead of starting lower plans at the $1 to $4 price point, it makes more sense to start with a freemium tier that focuses on building that relationship with their audience. Then, once the audience spends the time to get to know the creator, the willingness to pay goes up, and they have more incentive to support higher and more valuable rewards. The question then is, why do people want to support these creators? What are they getting in return for their patronage? As each creator is able to set their own pricing and tier structure, the rewards are all over the place. We mapped the perceived value of each reward, with each quadrant showing various tiers' relative value to willingness to pay ratio. We found live feeds ended up in Trash Land, with a low value to low willingness to pay for most patrons, even though they are a regular offering on Patreon for community and audience building. Core Features like discounts were perceived as more valuable but still didn't really move the needle on willingness to pay. There was a higher value to willingness to pay ratio for Differentiating Features like early access, swag, and exclusive content, with creators having much more success with rewards tied to exclusivity and personal access. This builds on the idea of creating a community where people feel like they're a part of something special. One of the more interesting Add-Ons was a producer credit, where an individual with a much higher willingness to pay could get their name on a project as an executive or associate producer. For the right patron, this kind of ego boost can really help them feel like they're a part of the creator's process. Patreon has a huge opportunity to help creators think more strategically about adjusting their pricing structure and rewards system. By bundling knowledge into a simple pricing page or creating a best-practices guide for new creators, Patreon can boost the overall effectiveness of their campaigns. This not only helps the creator figure out what works for their patrons in their category but also teaches the creator to think about Patreon as a place to build and nurture relationships with their audience. This may start with a free plan but can grow into a systematic approach to building longer relationships and increasing willingness to pay with the right rewards. Patreon is riding the wave of a really interesting change in how creators and artists are supporting themselves. As Patrick says, their model is starting to go beyond just a subscription model into building relationships and recurring revenue. Patreon's best move is to help their users create a better overall pricing strategy that is based on willingness to pay and a rewards structure. This helps the creator be successful, and Patreon gets a cut as well. According to their model, the creator gets 90%, 5% goes to Patreon, and 5% goes to service and transaction fees. By helping their users be more successful, Patreon is increasing their revenue and building a community of their own.